The Refined Geek » Strike Suit Zero: One Ship To Rule Them All. Strike Suit Zero: One Ship To Rule Them All. The time between space sim style games is way too long in my opinion as there’s usually only one per year that manages to grab my attention. Even then most of them fail to live up to my expectations which I think is due to Freelancer setting the bar so high. Kickstarter seems to have been something of a haven for this niche genre however as I’ve backed not one but two of them recently. I was then surprised to find out that Strike Suit Zero, released just under a month ago on Steam, was the result of yet another Kickstarter that finished in November last year. Had I known about it then I probably would’ve thrown money at it sooner. Strike Suit Zero is set in the far off future where humanity has expanded to some of the furthest reaches of the galaxy thanks to a signal of unknown origin that urged them to do so. After a long period of colonizing many planets and star systems the source of the original signal has been found, an escape pod that contained highly advanced technology. The colonies, seeking freedom from Earth’s oppressive grip, struck a bargain for their independence. This didn’t last long as Earth discovered something that they didn’t want to reveal to the colonies, which lead to the expulsion of the Earth researchers and the revocation of the colonies indepdendence. War ensued and you, playing as a formerly disgraced space pilot named Adams, find yourself in the middle of it and quickly become one of the turning points in this conflict. 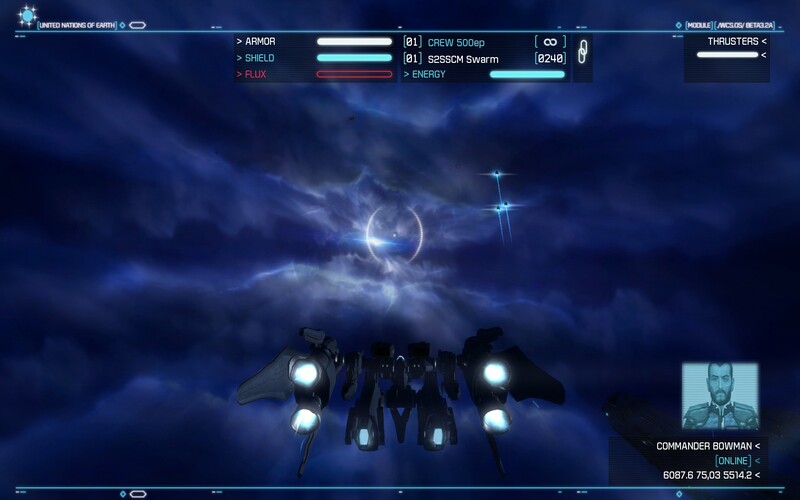 Compared to the other recent space sims that I’ve reviewed on here Strike Suit Zero is graphically superior, ostensibly owing to its origins as a PC only title. Compared to other modern titles released recently however it’s nothing to write home about with many of the models and animations being relatively simple. In earlier missions this leads to the battlescapes being somewhat empty and boring but as the missions get bigger and the targets more numerous it changes into a cacophony of lights, explosions and giant planets looming overhead. Essentially whilst the graphics aren’t anything to write home about they do work quite well, especially when compared to Galaxy on Fire 2 or SOL: Exodus. Strike Suit Zero favours a linear mission structure, giving you a list of 13 missions that you can complete from start to finish. Each one of them is divided up into check pointed sections with a pretty well defined set of parameters that need to be accomplished before you can move onto the next section. 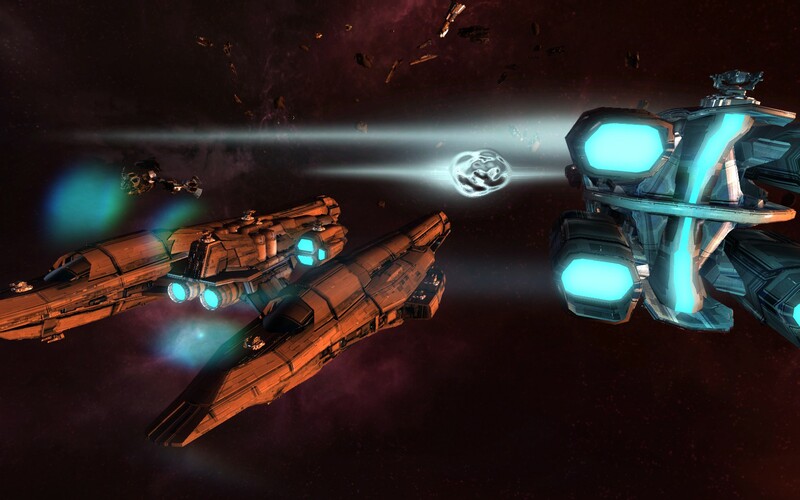 It’s reminiscent of the stages of PVE missions in Eve-Online although the triggers, instead of being a certain ship or NPC structure, are usually something like “destroy all the things” or “destroy these things in this order”. If you were looking for an open ended experience Strike Suit Zero isn’t it, but that doesn’t mean you don’t have some influence over how the mission progresses. 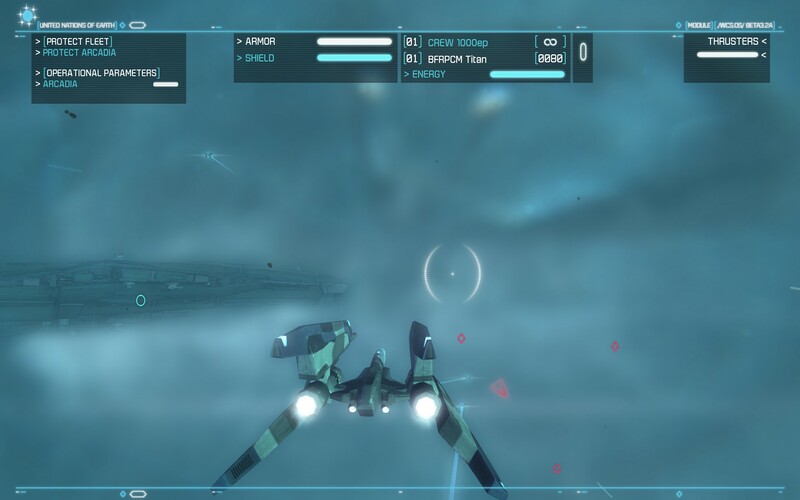 The first few missions are heavily centred around good old fashioned ship to ship combat which usually entails you chasing down enemy craft whilst pummelling them with missiles, lasers and, interestingly enough, machine guns. All of this works as you’d expect it with missiles requiring lock on and dumb fire weapons requiring you to lead your target with the help of a HUD aim assist. Nothing particularly out of the ordinary which is to be expected as it’s much like FPS’s in that regard with formulaic approach being good due to the level of refinement it has received over the past 2 decades. One of the major selling points was that whilst you might be the main character of the game Strike Suit Zero still wanted to make you feel like you were part of something much bigger. This was something that I’ve always wanted to see in space sim games as many of them make you the entire focus of everything which limits the potential for huge, awesome battles in space. 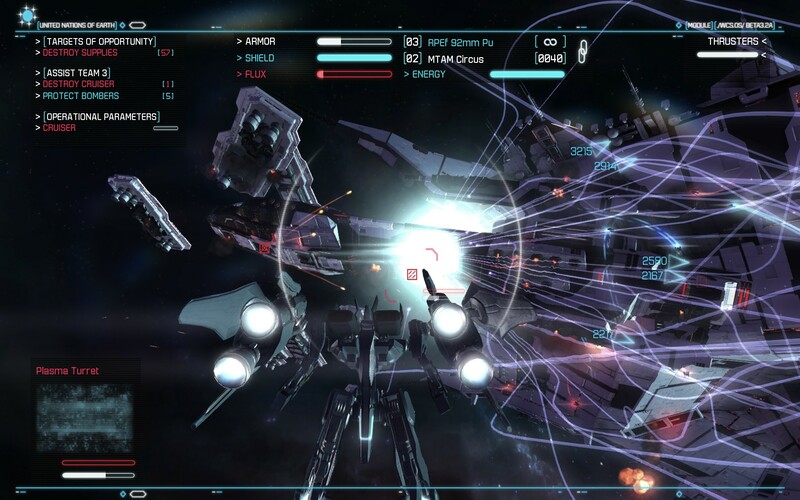 Strike Suit Zero stays true to its word in this regard as once you’re past a certain point you’ll be facing off against ships that are hundreds of times more massive than yourself but you’ll be backed up by equally as impressive ships and a whole fleet worth of fighters at your side. When this first starts happening it’s quite awesome as you duck and weave your way through the throng of fighters in order to square up against a giant capital ship, usually so you can take down some critical part of it. However as you progress and the ship number increases (along with the power of their weapons) it becomes clear that the AI really likes to target you in preference to, well pretty much everything else. This leads to some missions which require you to make tedious runs past the capital ships, inflicting a small amount of damage before you have to jet straight back out again lest you end up a pile of wreckage. I understand that this is part of the challenge but there was many a dogfight where I was the only target of any enemy fire which left me spending countless minutes simply running away from everything rather than being part of the action. Once you get the Strike Suit this changes a bit as its Strike Mode allows you to unleash all sorts of pain in short order. However whilst you’re highly maneuverable you can’t use your emp or thrusters which, combined with the fact that the AI targets you even more heavily, makes you something of a glass cannon. Now this is probably something that can be countered by doing the additional objects in order to get the upgrades (which I got the majority of) but they don’t seem to have much of an impact past keeping you in line with the ramping up of the mission difficulty. Usually with these kinds of games you get to craft a ship which just massively out-guns anything you come across but you can’t really do this in Strike Suit Zero, which is a little bit disappointing. The story is also decent but it’s let down by the mediocre voice acting which is usually delivered flat without much feeling behind it. For instance whenever the enemy seems to surprise one of the fleet commanders they sound as if they’re one of the Neutrals from Futurama reacting to the beige alert on their screen. I can’t comment on the conclusion as I stopped playing it in frustration when one of the missions took forever to complete and then placed me right beside a carrier, killing me instantly and forcing me back 15 minutes. For the time frame that it was delivered in Strike Suit Zero is pretty impressive as it has all the trappings of the space sims of yore whilst avoiding many of the mistakes of more recent titles. However I feel like there was so much more that could be done with things like the upgrade system, ship choice and breaking away from its highly linear nature. Strike Suit Zero then is a great base for Born Ready Games to expand upon, using the universe that they’ve created to form the foundation for future titles. 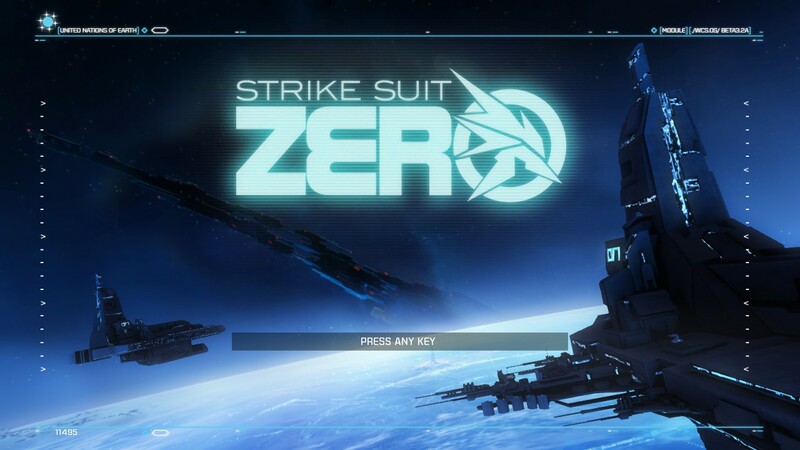 If you liked games like Freelancer you’re sure to enjoy Strike Suit Zero, but be sure to go in with your expectactions set accordingly. Strike Suit Zero is available on PC right now for $19.99. Total play time was 5.2 hours with 50% of the achievements unlocked.